This book celebrates Carlos Almaraz, one of the most influential Los Angeles artists of the 1970s and 1980s. 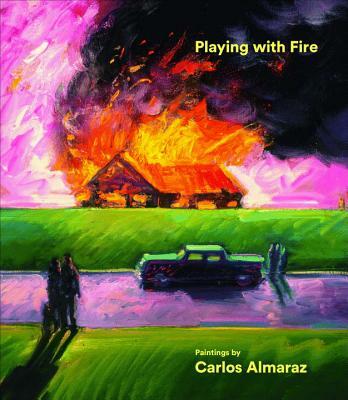 Playing with Fire: Paintings by Carlos Almaraz is the first full length monograph devoted to an artist known for both his politically engaged cultural production as well as his vibrant, highly sought-after studio art, particularly his scenes of car crashes and pastoral depictions of L.A.’s Echo Park. Among the leading figures whose artistic, cultural, and political motivations catalyzed the Chicano Art movement in the 1970s, Almaraz began his career with works for the United Farm Workers and cofounded the important artists collective Los Four. Although he saw himself as an activist, Almaraz straddled multiple—and often contradictory—identities that drew from divergent cultures and approaches, and his work became less overtly political and more personal, psychological, dreamlike, and even mystical as he evolved artistically. The book features more than 60 works, mostly from the late 1970s through 1989, the year of the artist’s untimely death at age 48, as well as selections from his journals and recollections from numerous colleagues and friends who knew him throughout his career. Howard N. Fox is former Curator of Modern and Contemporary Art at the Los Angeles County Museum of Art.